The global optometry market is envisioned in a report by Transparency Market Research (TMR) to hold a fragmented characteristic for its vendor landscape. Companies are observed to make desperate efforts to retain their shares of the market and grow strong in the coming years. With a view to outsmart their opponents, they are expected to rely on demand for improved treatments and therapies. With their extensive regional outreach and broad product portfolios, larger companies could take a leading position in the market. Some of the prominent companies functioning in the market are Pfizer, Inc., CooperVision, and Novartis AG. 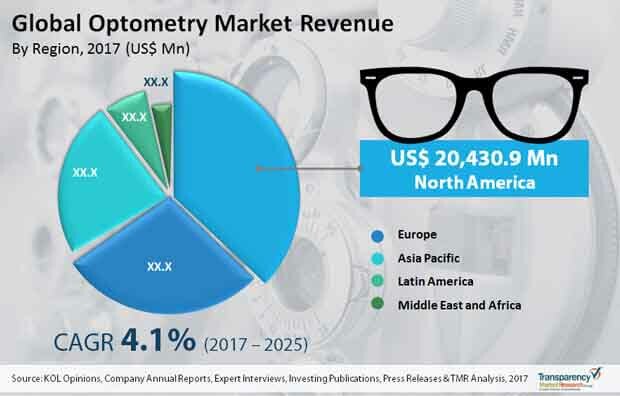 By 2025, the global optometry market could bag revenue worth a US$79.8 bn while expanding at a 4.1% CAGR during the forecast tenure 2017-2025 as foreseen by TMR. In 2016, it was valued at a US$55.9 bn. Anti-inflammatory drugs classified under therapeutics by type of product are envisaged to secure a higher share of the market, considering their 32.5% attained in 2016. By region, North America could collect a king’s share of the market, taking into account its 36.5% achieved in the same year. Diabetes and other chronic health conditions in geriatrics are researched to be among primary factors triggering vision problems in them. Moreover, geriatrics are observed to be highly vulnerable to vision complications due to other reasons. Thus, expansion of the geriatric population across the world is anticipated to serve as a powerful factor augmenting demand in the global optometry market. Demand for optometry could also increase on the back of swelling prevalence of cataracts, diabetic retinopathy, glaucoma, and age-related macular degeneration (AMD). In the U.S., diabetic retinopathy is observed to have affected nearly 7.6 mn people, as per the finding of the American Association of Ophthalmology. The organization also found another 20.5 mn people in the country affected by cataracts. Low affordability and purchase power of developing economies could limit adoption of optometry therein. Patients may find it unaffordable to opt for optometry tests or purchase optometry drugs. However, government initiatives to make healthcare affordable for everyone are prognosticated to create opportunities in emerging regional markets. Growing awareness about eye care and need for eye tests due to rising incidence of refractive errors and eye diseases are foretold to set the international optometry market for positive growth in the near future. The possibility of finding cures for different visual problems on account of constant technological development could encourage players to expand their product portfolios. Furthermore, increasing preference for contact lenses and introduction of fashionable spectacles are projected to offer a wealth of opportunities in the market.